DJ Khaled dramatically proposed to Nicki Minaj on MTV Thursday. And though the 30-year-old rapper has yet to respond, she made sure to flash a massive diamond sparkler on her ring finger while in Beverly Hills Sunday night. Nicki covered her curves in a ‘Love Dirty’ T-shirt, matching pink trucker hat, and bright yellow skinny jeans tucked into Christian Louboutin boots. ‘Laguardia Girls unite!!! Thembi, Justine & Nia my boos,’ Minaj tweeted to her 16.8 million followers. The former American Idol judge collaborated with the 37-year-old producer on her latest single Twerk It as well as a 2010 remix for Khaled’s All I Do Is Win. Last Thursday, the heavyset hip-hop star presented Nicki with a 10-karat radiant cut diamond ring from Rafaello & Co – worth a reported $500,000. ‘Nicki Minaj, I’m at MTV, I’m going to be honest with you; I love you. I like you, I want you, I want you to be mine,’ DJ Khaled said onscreen. Khaled then confirmed to Us Weekly on Friday that he ‘was serious’ and he was still waiting to hear back from her. 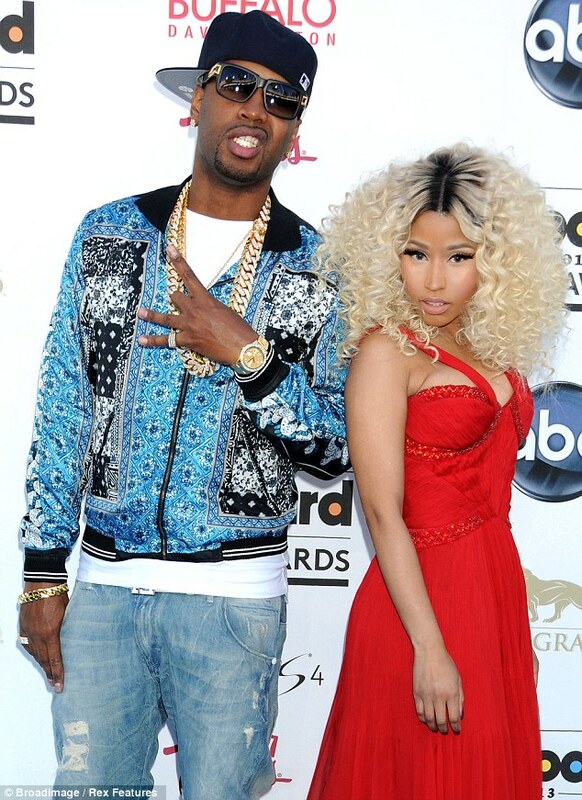 The Roman Holiday hitmaker was thought to be paired with her Pink Friday Productions president Safaree Samuels, but many say their relationship is strictly professional. Meanwhile, Nicki just released an image of her third fragrance Minajesty, which hits shelves this fall. The outlandish pop star, born Onika Tanya Maraj, also posted a sneak peak of her get-up for the David LaChapelle-directed perfume commercial. Next April, Minaj will maker her big-screen debut in The Other Woman alongside Cameron Diaz, Taylor Kinney, and supermodel Kate Upton. The Harajuku Barbie will play Cameron’s ‘opinionated, sharp, and brutally honest’ legal assistant who’s on her third marriage in Nick Cassavetes’ comedy.